Green Bambu series Blending by Bdellium tools. 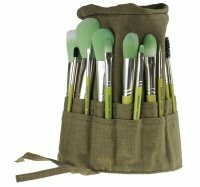 The brush was designed for shading and combining different colors, as well as applying loose and creamy cosmetics. It was made of high quality synthetic bristles, trimmed and properly shaded. Slightly flattened head was embedded in a metal cap, allows for uniform distribution of hair. Perfectly combines lines of different colors and supports precise application. Bamboo handle is characterized by exceptional hardness, robustness and precision of execution.